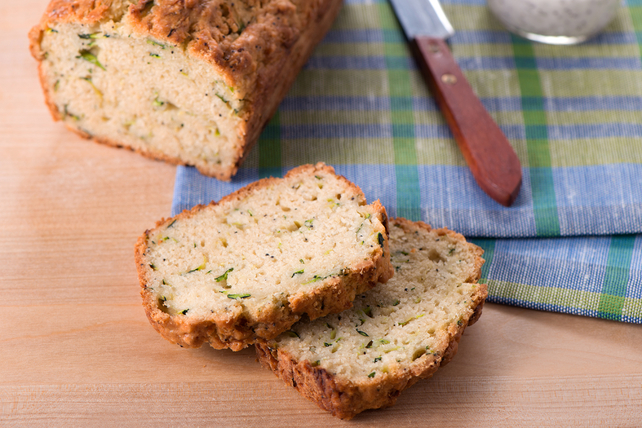 This tasty bread recipe gets most of its flavour from the zucchini, and yes - poppy seed dressing! Mix flour, sugar, baking soda and baking powder until blended. Pour into 2 greased and floured 9x5-inch loaf pans. Bake 1 hour to 1-1/4 hours or until toothpick inserted in centres comes out clean. Cool 15 min. Remove from pans to wire racks; cool completely. Stir 1/3 cup coarsely chopped walnuts or pecans into the batter before pouring into prepared pans and baking as directed.